The piece is divided into two untitled movements which, with permission from Goodwin, anteroom performed in reverse order. In movement II. Goodwin, inspired by a recent interaction with Jaap Blonk, has arranged a system of connected groups of phonetic characters the performers are to move through freely. The phonemes are pulled from the first word of movement I. consider. Movement I. is entirely text-based and offers a meta-structure for a piece. It is an excellent example of the kinds of text-scores which originally sparked our interest in the medium. It’s openness allows the performer to pour oneself freely into the music and into the performance, while its general guidelines offer helpful direction which aid in preserving a coherent intention throughout an ensemble. Our process for realizing movement I. was as follows: improvise with the words with no prior discussion, discuss patterns and metaphors we noticed, improvise under more guidance, sketch a general graphic score, refine delivery. Through this process we were able to agree upon a point of unity which was realized by dropping metal coins into metal pots and revolving them in a counter-clockwise motion. We established two stages to precede the point of unity. First, Miller moved wood against wood in a vertical motion while Jackson moved wood against metal in a circular motion. Second, Miller moved skin against skin in a sweeping motion resulting in a rapid vibration between the two materials; Jackson, meanwhile, rapidly vibrated metal against metal. Each stage was divided into two characteristics: material and gesture. In stage one neither material nor gesture aligned between Miller and Jackson. In stage two gesture aligned while material did not. In stage three both material and gesture aligned. Thus, a simple three step motion towards a point of unity, followed by a pause, and, finally, a slow detachment. performed 27 May 2012 in Dallas, Texas at The Reading Room by anteroom. Looking at the score structurally, we find three sections of articulation. First a section of single words, followed by a section of photographs and finally a phrasal section consisting of full sentences. Each section features four groups. The first three are always isolated individuals while the final fourth is composed of a pair, suggesting a correlation between each group across the three sections. The final instruction of suggested duration, perhaps the most objective and easily attached to a historical practice of music, falls just outside the noted pattern. The intention in performance was to wade the area along the spectrum of listening which this piece addresses; which seems to be somewhere between casual listening and a kind of unperceived ambiance. We wanted to encourage a kind of listening where sounds are experienced but not always noted so closely, so as to allow them to blend into one another without the complete awareness of the listener. This intention was embedded within a higher goal of facilitating a time of serene monotony, where no single moment stands out, no form or narrative is remembered, rather, an experience for which a state of mind or a certain color would suffice as a description. Kind of like remembering a walk through the park, and not thinking of a woman seen, or a puddle stepped in, or any other details in particular, but just that it happened, and that somehow it was very nice. 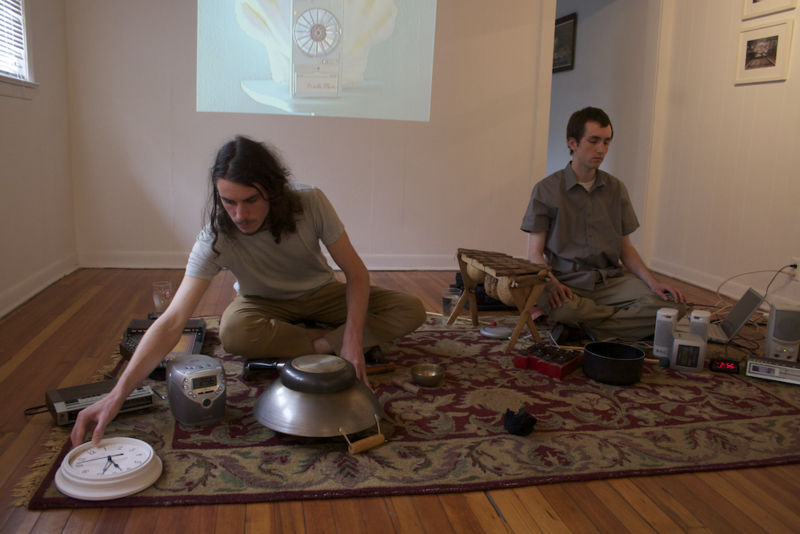 The chosen instrumentation consisted of amplifier hum, field recording pushed through small speakers, peruvian flute, yarn, coins, lighter, rain jacket, book, along with various woods, metals, glass, and ceramics. performed 20 october 2011 in Denton, Texas at UNT on The Square Gallery by anteroom. Manfred Werder (b. 1965) is a Swiss composer whose work addresses the basic elements of musical and auditory experience. His process of relieving musical materials is articulated most elegantly in his recent series of compositions, beginning with 2005(1). The score contains only six words: “ort/zeit/( klänge )” as well as the English “place/time/( sounds )”. He has since created more pieces in this series, all titled after the year and rank of the composition within that year and each focused on the ability of his text scores to create awareness of an environment that we simultaneously inhabit and create for ourselves. On March 13th, 2011, anteroom performed 2005(1) at Tex Gallery in Denton, TX during the 35 Conferette, an annual event featuring independent music acts from across the country. Our interpretation resulted in a three hour performance of the work informed by three views of the score. First, a linguistic analysis of the English half of the score, which lead to multiple readings of its content through implementing different interpretations of the grammatical and syntactic structure of the score itself. Second, an understanding of the performance practice of Werder’s recent series of works through previously recorded documentation and literature; and finally, a concern for the appropriate place and time for the delivery of 2005(1) as manifested in the 35 Conferette event. Our performance was divided into three one hour sections, each addressing a different linguistic interpretation of the score. During the first hour, place was interpreted as an imperative verb, and time-sounds as a compound noun resulting in a score that instructs the performers to place, or arrange, time-sounds. This section was realized by placing various ticking clocks in the gallery, as well as arranging for a few electronic alarm clocks and clock radios kept at minimal volume to sound off periodically within the space. We chose intuitively when to activate the snooze feature on each sounding clock, allowing the unique characteristics of each device to determine its own duration of rest. For the second hour of the performance, all words in the score were interpreted as discrete nouns bringing about three isolated concepts for the performers to consider while playing. This allowed the “world” to emerge in our performance, relating to Werder’s comment, made in an interview with composer James Saunders, about his work “(operating) in relation to our complex situation of being the world, and at the same time observing the world.”† This section was mostly silent with a few sparse, quiet articulations made on different sounding objects – sticks, stones, stirring inside flower pots and metal pans, a few isolated notes on a toy xylophone, the sound of water pouring into a glass, etc. Our activity as performers was governed by our observations of our sonic surroundings during this section, and all articulations sought to achieve a balance with the surroundings. The third hour of the performance joined place-time as a compound noun. Sounds was interpreted as an infinitive verb resulting in a score that doesn’t so much instruct but rather makes an observation. For this section, we played quiet field recordings of the sounds produced within 35 Conferette from the previous day, capturing distant music, applause, and traffic. About midway through this hour, the sounds surrounding the gallery were amplified inside the performance space using a microphone previously placed through a gallery window. Overall, our performance of 2005(1) strove to consider both the linguistic and conceptual readings of the score. Conceptually the three sections stand independently of one another, while linguistically they rely upon each other to create a formal continuity though the palindromic arrangement of the sections: verb, noun / nouns / noun, verb. Here Sfirri considers the the ambience of natural silence not only a palette of musical possibility, but also the extreme dynamic of the piece. Silence becomes a kind of inherent screaming tutti, arranged and laid atop the reflection of its very intention. The sounds of this recording are produced by a small array of objects including one guitar amplifier, one am radio, and two field recordings each being pushed out a set of small speakers. The sounds are intended to meld into a certain composed silence which, layer by layer, is stepped into the silence intrinsic to the time of listening to the recording. Microphones were placed quite close to each object, encouraging a contextual dissonance between the production and the metaphor of the sounds. 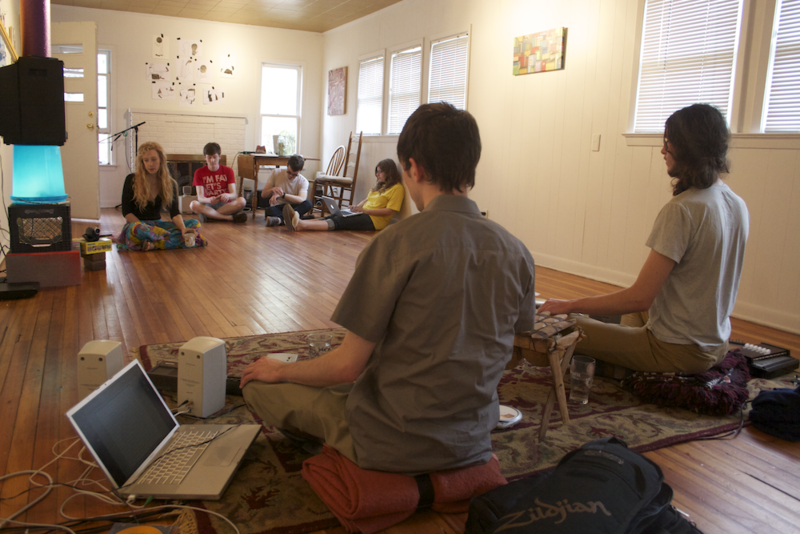 performed march 2011 in Denton, Texas by anteroom. recorded by Brian Hernandez at the University of North Texas. This recording was made in the familiar environment of Room 239. The door to the adjacent computer lab was left open – allowing the sounds of peoples’ conversation, computer fans, fluorescent ambiance, and the occasional footstep of passerby on linoleum and carpet to reach the ears of Jackson and Miller. 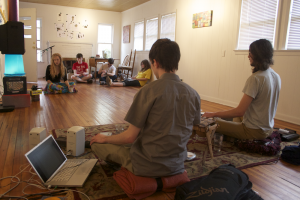 The score indicates that the performer’s are to listen to the sounds present in the performance space for the first five minutes of the piece. During this time, the performers transcribe the sounds they hear by writing down descriptions of the “overall shape or contour of the sound, dynamic level, duration, etc.” Each description is written next to a marking of the time at which that sound is heard. Time is measured by stopwatches. Thus, the first five minutes of the recording exists predominantly as quiet scribbling sounds as anteroom listen to their surroundings and translate what they hear into written language. Following the initial five minutes of transcription, the performers reset their stopwatches and begin translating the written descriptions of sounds into instrumental performance. The timings of the original heard sounds and the performance of their respective instrumental translations are to coincide – thus, a “loud strike” listed at the 0:18 mark in the first half of the piece may be translated into a tambourine strike at the 0:18 mark in the second half of the piece (5:18 on the recording). 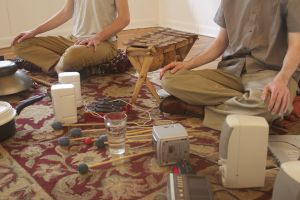 A number of sounding objects/instruments were used for this realization: acoustic guitar (played in various ways, mostly on the wooden body), autoharp, a small South American marimba, tambourine, bongos, paint can, pans, vocal percussion sounds, and a pillow. 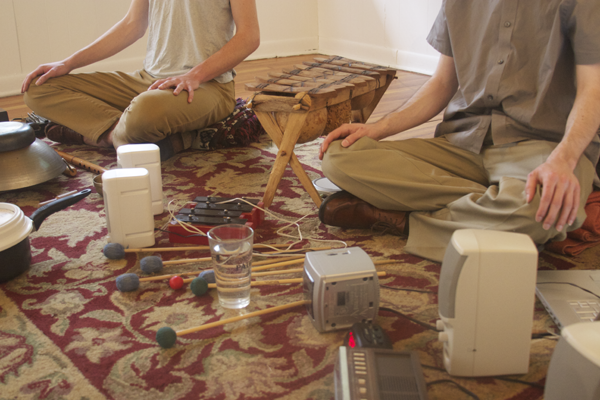 The resulting performance exists as the direct manifestation of a process of listening, transcribing, and translating everyday sound to instrumental performance. “The silence of the performance space is acoustically reflected, passing first through language, then mediated through performers’ music-technological engagement with instruments and objects,” G. Douglas Barrett. In Boundaries, the point of observation is aimed upon the edges of a concept and the bleeding over from one to its more general description. Focusing on the linguistic and perceptual overlap between Sound and Vibration, it is hoped one be pushed into the butterflies of an ungrounded tilt during moments of utter trying. 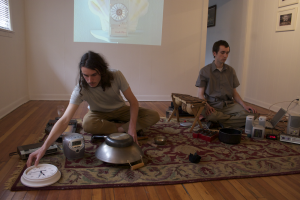 In this recording, Jackson and Miller are striking cymbals of various characteristics along with an autoharp, desk bell, nylon strung guitar, and tibetan singing bowl. Here, the decline of amplitude has been chosen as a path from Sound into Vibration. Their ears were held always quite close to the instruments during delivery, carefully and patiently guaging the change in dynamics over time after each strike. Microphones were also placed quite closely to each instrument as to emulate, for the listener, the experience of the performer.